The “control” part of organic weed management aims to remove weeds that threaten current or future production at the least possible cost in labor, fuel, machinery and potential harm to the soil. Trying to eliminate every weed on the farm would likely lead to red ink, and can defeat efforts to build healthy soil. Thus, the farmer must continually evaluate: do I need to kill the weeds in this crop now? When are the critical times for weed control during the course of the season? Weeds that emerge before or with the crop have a greater impact on crop yield than later-emerging weeds. Planting into a clean, weed-free field is essential. Remember that an apparently clean seedbed prepared just a few days before the vegetable is planted may have millions of germinating weed seedlings per acre that have not yet visibly emerged (Fig. 1). Whenever possible, plant immediately after the final step in preparing the ground – whether that step is harrowing, rototilling, incorporating amendments, shaping the beds, or strip-tilling the crop rows. Figure 1. 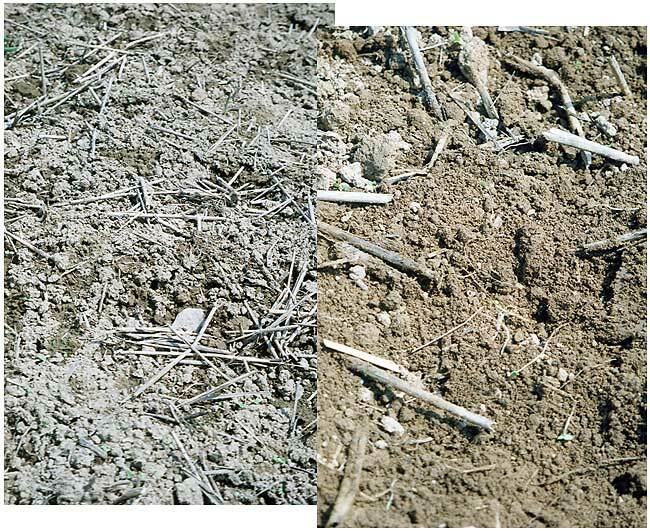 This seedbed was prepared a few days before the photo was taken (left). It may seem clean enough, but stir the surface lightly and look again! (right). A very shallow cultivation immediately before planting can knock out a lot of these newly-germinating weeds resulting in a cleaner seedbed. Photo credit: Mark Schonbeck, Virginia Association for Biological Farming. For many crops, blind cultivation can be used to keep the seedbed clean until the crop is up. Larger-seeded vegetables can be rotary-hoed to give them a head start. Weed seedlings that beat slow-germinating crops like carrot to the punch can be removed by flaming. Some farmers time this operation by covering a small patch with a pane of glass. When the crop first emerges under the glass, the field is flame-weeded. The rest of the crop then emerges a day or two later, in a clean field. This approach may be especially advantageous during early stages of crop establishment and growth (Fig. 2). Cultivate before weeds get more than an inch tall. Some weeds develop an incredible ability to reroot and survive light cultivation once they pass this stage. Weeds two to three inches tall require more vigorous cultivation, which consumes more fuel, disrupts soil structure, and stimulates additional weed seed germination. Figure 2. This basket weeder works only a fraction of an inch deep, removing tiny weeds from between these rows of young brassica plants. Photo credit: Mark Schonbeck, Virginia Association for Biological Farming. One possible disadvantage to this “proactive” approach to timely cultivation is that it can result in multiple passes through the field to keep removing small weeds until the crop is established. An alternative strategy, which strives to minimize the frequency rather than depth of cultivation, may be appropriate in certain circumstances (See Sidebar). Many good tools and implements have been developed for shallow between-row and within-row cultivation for different vegetable crops at various stages of development. Avoiding Overcultivation: Minimum Versus Critical Weed-Free Periods. Weed scientists and farmers have a couple ways of estimating when cultivation is most important for keeping weeds from hurting the current crop. One is to ask how long after crop planting can weeds be allowed to grow before they must be removed (the “maximum weed-infested period”). Another is to ask how long the crop must be kept clean before later-emerging weeds can be allowed to remain (the “minimum weed-free period”). A third is to determine the stage(s) of development in which the presence of weeds is most likely to hurt yields (the “critical period of weed competition” or “critical period for weed control”). Assuming that the crop is planted into a clean seedbed, germinating crops and weeds start their “race” at the same time. Weeds that germinate with the crop usually do not affect the crop’s growth until two or three weeks after emergence – when they first become large enough to begin competing for moisture and nutrients. This initial “grace period” during which weed can grow without reducing the crop’s yield potential is the maximum weed-infested period. The farmer needs to cultivate or otherwise control weeds before the end of this period. Weeds that emerge with or shortly after the crop have the greatest potential for causing economic damage if allowed to grow unchecked. Later emerging weeds have less effect, and those that emerge after a certain point in time no longer affect yield. This point is the minimum weed-free period. However, this approach can be risky especially in vegetable crops that are not highly competitive or have long critical periods for weed control (e.g., carrot), or that need to be quite clean at harvest (e.g., mesclun, baby lettuce). When cultivation is delayed until the beginning of the critical period for weed competition, the farmer depends on favorable conditions for effective cultivation at that time. If an untimely rain falls, the additional delay will likely result in a significant yield loss. Therefore, most Extension agents and consultants advise organic vegetable growers to “get weeds while they are small," especially early in crop development. Once the early flushes of weeds have been knocked out, continue monitoring and controlling later-emerging weeds until the crop has passed through its minimum weed-free period. For vigorous vegetables this period is generally the first one-third of the crop’s growing season, or four to six weeks for crops like tomato, squash, cucumber, snap bean, and transplanted brassicas; and perhaps a little longer for eggplant and pepper. Less vigorous crops like onion or carrot may need weed-free conditions for at least the first half of their life cycle, perhaps eight weeks or more. How "clean" is clean enough during this period? Crops differ in their inherent weed tolerance even during the minimum weed-free period. Slow-growing, weed-sensitive vegetables like parsley, direct-sown onion or carrot can suffer if weeds are allowed to reach the two-leaf stage before cultivation. Thus, it may pay to "cultivate early and often," knocking weeds out in the white-thread stage until the crop is well established. In vigorous crops like beans, sweet corn, or potatoes, one early cultivation and a second pass to remove later-emerging weeds at the two-leaf stage or even a little larger, may be sufficient. While the crop is still small, those weeds emerging closest to crop plants compete most severely. Therefore, cultivation must effectively remove within-row weeds, as well as weeds between rows. Timing is critical for mechanical within-row weeding, which works only when the weeds are tiny and the crop is sufficiently large that it can withstand the effects of light cultivation. 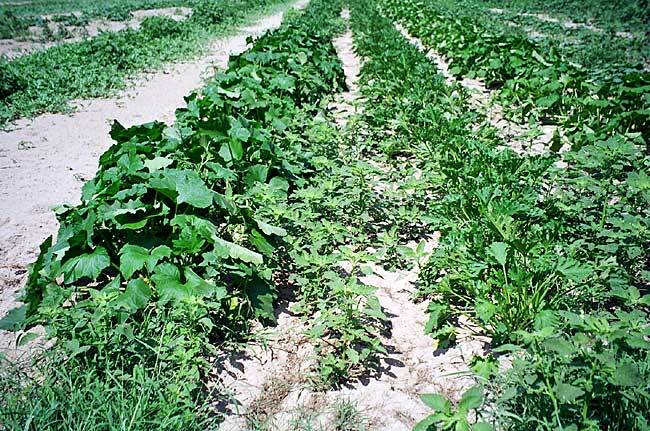 Later in the minimum weed-free period, the growing crop begins to shade out emerging within-row weeds, while weeds emerging between rows can still grow unimpeded and pose a threat. 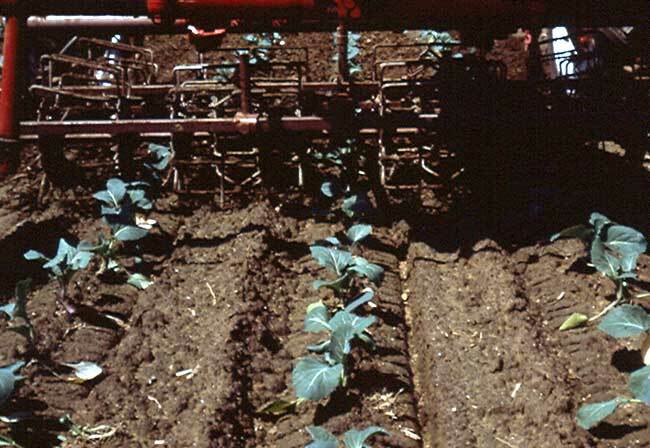 At this point, some vegetables can be cultivated with a between-row implement adjusted to throw some earth into the row to bury and thereby hinder small within-row weeds. This works well for potato, corn, tomato, broccoli, and other tall vegetables that tolerate hilling-up, but of course not for lettuce, spinach, and other vegetables whose edible parts form close to the ground. Invasive or wandering perennials like quack grass, nutsedge and Canada thistle that reproduce through a propagating network of rhizomes, roots, stolons, tubers or bulbs are often the most difficult to manage. An initial tillage pass deep enough to chop up these structures will effectively propagate the weed, as each fragment soon regenerates a new plant. However, these plants are weaker than the larger plants growing from undisturbed underground structures. During the first three or four weeks after fragmentation, the pieces of root or rhizome draw down their underground reserves in order to regenerate shoot growth. One the growing weeds each have several open leaves, they begin rebuilding reserves through photosynthesis. Soon thereafter, they can begin to form new rhizomes, bulbs, tubers, or other vegetative propagules. Additional tillage, or even simply removing top growth, whenever the weeds reach the three to four leaf stage can be quite effective in further weakening invasive perennial weeds (Fig. 3). The farmer may need to do this several times at three or four week intervals to knock out a serious infestation. Planting buckwheat or other “smothering” cover crops at high seeding rates immediately after tillage intensifies pressure on the weed, and can get the job done faster with fewer tillage passes. Figure 3. This bed was tilled just before setting out the broccoli, which fragmented some of the roots of a localized Canada thistle infestation. Severed roots and fragments have now regenerated new plants, which are getting large enough to begin rebuilding reserves. Immediate cultivation or hoeing is needed to continue the process of weakening this invasive perennial weed. Photo credit: Mark Schonbeck, Virginia Association for Biological Farming. 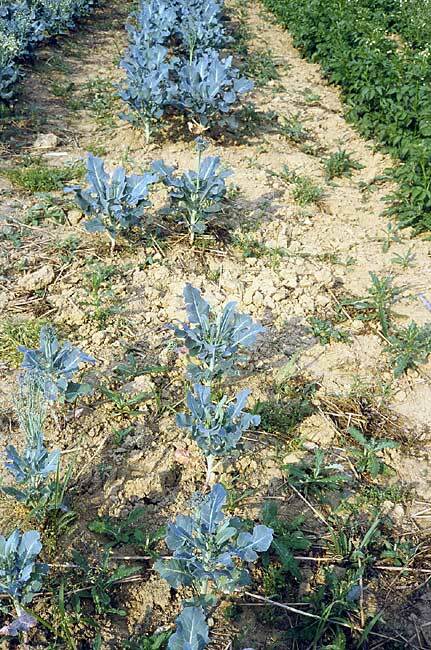 When wandering perennial weeds emerge in a vegetable crop, cultivate to sever top growth whenever the weeds reach this critical three to four leaf stage. Sharp sweeps or knives set to work just below the soil surface will do the job. Once the crop has passed through its minimum weed-free period, weed control need not be so stringent. However, it is vital in organic production systems to prevent weeds from forming viable seeds. Four consecutive years of preventing all weed seed return can substantially reduce population density of the spring and early summer flushes of weed emergence. While this can be difficult to achieve at the farm scale, efforts to minimize weed seed formation pay off in lower weed densities in the long run. Late-emerging weeds are easy to manage in quick-maturing vegetables that are harvested before these weeds have a chance to flower. Simply till or mow promptly after harvest and before weeds set seed. Growing several short-season vegetables in quick succession is one way to limit weed propagation and can even draw down weed seed populations in the soil (weed seed bank). In longer-season vegetables, additional measures are often needed to prevent these later weeds from setting seed, such as between-row mowing or cultivation, or manual pulling or cutting. As soon as harvest is complete, mow or till to terminate any further weed propagation. Weeds that have become overshadowed by the crop canopy may form relatively few seeds, whereas large, emergent “escapes” can make huge deposits into the soil’s weed seed bank and create major weed problems for future seasons. It often pays to “walk the fields” to rogue-out the large weeds before they release thousands of mature seeds each (Fig. 4). Remember that an uprooted or severed weed can often finish ripening immature seeds, so get the weeds before pollination occurs, or remove them from the field. Figure 4. These pigweeds came up late enough and far enough from the summer squash not to have any effect on the size or quality of the harvest that is about to begin. However, time taken to pull or chop out these plants before they mature can pay off severalfold by preventing a large "deposit" into the field's weed seed bank. Figure credit: Mark Schonbeck, Virginia Association for Biological Farming. Pay attention to invasive or wandering perennials, many of which actively form their “seed” underground by the time top growth is a foot tall. Even when it is not practical to prevent their propagation altogether, vigorous cultivation or close mowing between crop rows, and over the entire field immediately after harvest, will limit the formation of viable rhizomes and tubers. If weeds seem to "take over" a particular field, it usually means that insufficient attention has been paid to weed management over a period of time. Missing one or more critical times for weed control during a particular season can result in weeds gaining the upper hand over the crop. Allowing weeds to propagate can mean higher weed population densities that are harder to control the following season. When weeds tend to "take over" despite diligent and timely cultivations, more attention to preventive (cultural) weed management practices is needed. These may include adjusting the crop rotation to disrupt weed life cycles, increasing the use of cover crops, improving soil nutrient management to favor the crop over weed growth, or even rotating a weedy field out of production into a perennial grass-clover sod for a few years. Invasive, vegetatively reproducing perennials can be especially difficult to manage, and can occasionally get out of control despite a diligent, integrated weed management program. If a heavy infestation develops, hit the weeds repeatedly when their underground reserves reach their minimum (when shoots have three to four leaves). Planting a fast-growing, highly competitive cover crop like buckwheat, cowpea, or rye + field pea immediately after the second or third tillage can further delay regeneration by the now-weakened perennial weeds, as well as helping to restore soil organic matter and soil quality lost through repeated tillage. This article is part of a series on Twelve Steps Toward Ecological Weed Management in Organic Vegetables. For more information on organic weed control tools and methods, see An Organic Weed Control Toolbox.